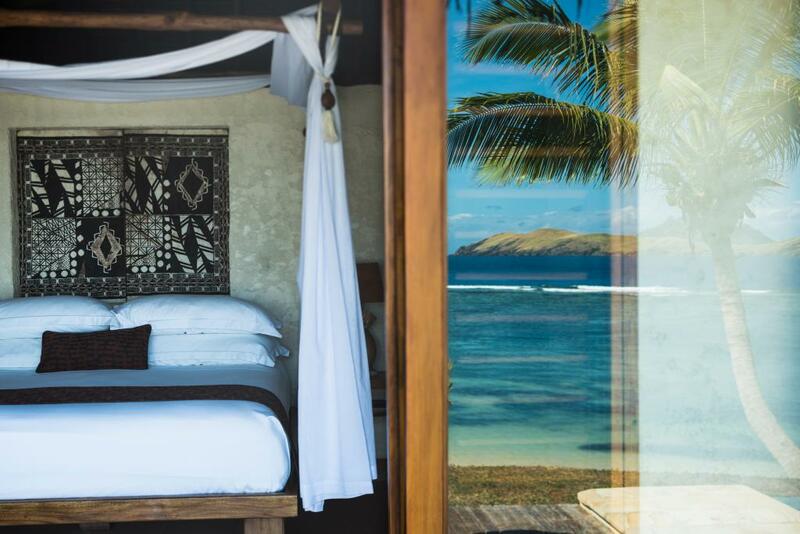 Tokoriki Island Resort offers a relaxed and friendly resort atmosphere that boasts the perfect private Fiji accommodation for couples and adults. 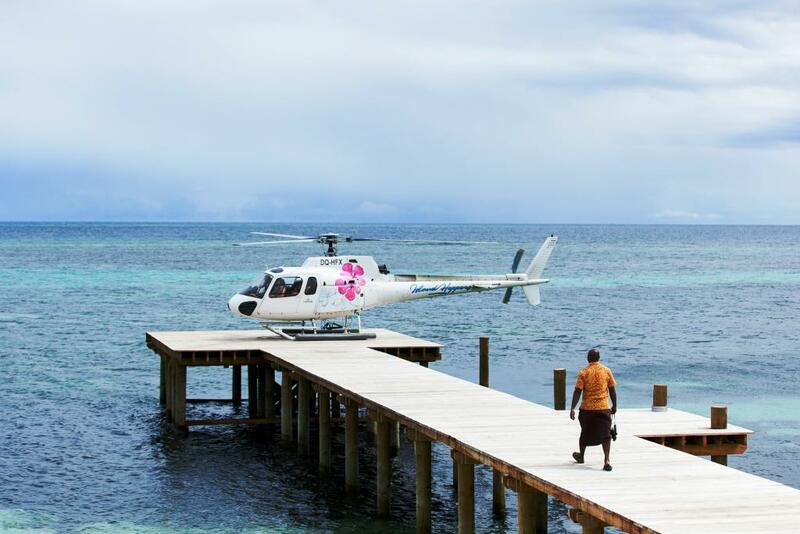 This amazing Fiji resort is set on one of the northernmost islands in the Mamanuca Group and can be easily accessed by helicopter or by boat from the mainland. 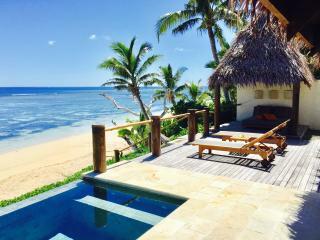 This beautiful private Fiji island resort will have you relaxed within moments of arriving, imagine sharing a sumptuous picnic on your own private beach for the day. Snorkelling amidst a rainbow of tropical fish on our prolific house reef. Having a romantic candlelit dinner under a blanket of stars or simply doing as much or as little as you please every single day you are there. 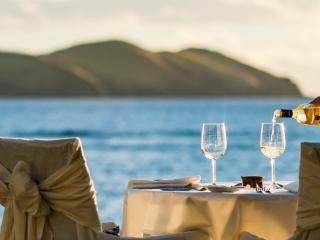 Tokoriki Island Resort is the ideal Fiji Holiday choice for a romantic getaway, a place to switch off relax and enjoy the tropical Fiji island culture. 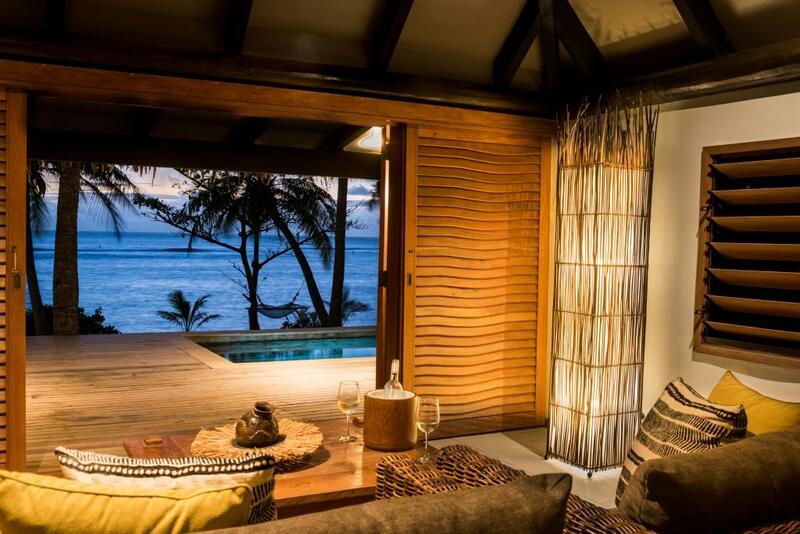 The Bures and Villas on Tokoriki Island Resort will not disappoint and have been designed specifically with adults and couples in mind. 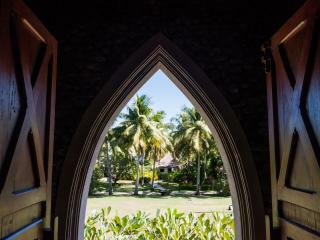 The spacious and open plan areas take advantage of the cool sea breeze. The facilities at the resort will ensure a relaxing and memorable holiday for all including a day spa, restaurant, bar, library and lounge. 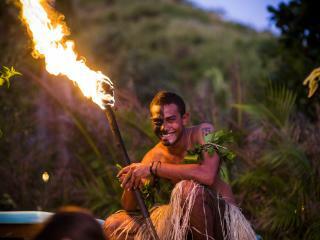 For your next Fiji holiday why not stay at the relaxed and secluded Tokoriki Island Resort. 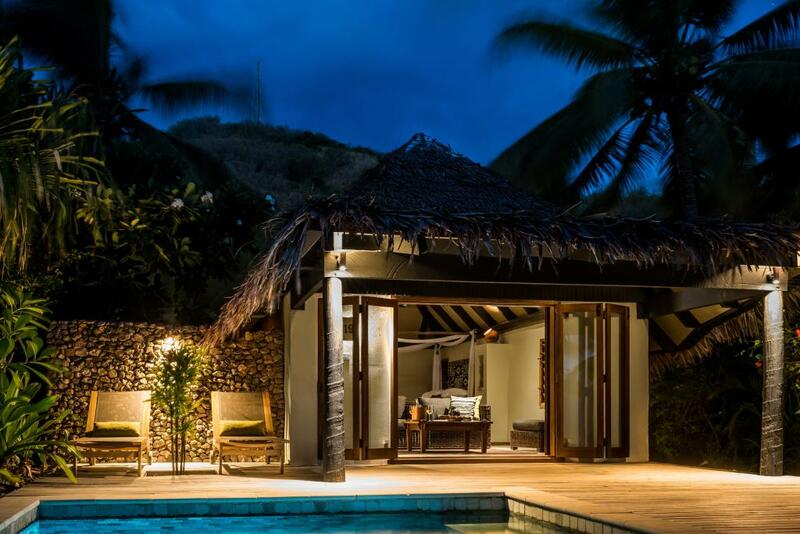 Tokoriki Island Resort offers 36 bures and villas that feature a magical combination of Fijian architecture and detailing with all of the modern luxuries and amenities expected in an upmarket experience. 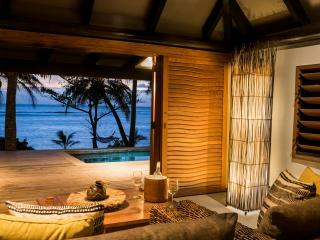 Your bure or villa is spacious, freestanding, air conditioned, and has its own private outdoor shower. 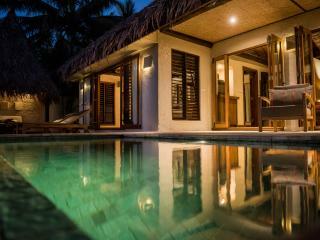 Beachfront Pool Villa: Total of 10 Beachfront Pool Villas. Size is 120m². 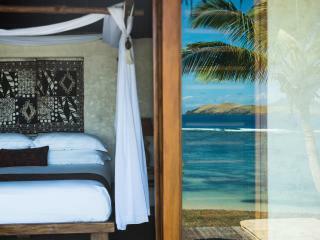 These fantastic Villas offer open space with separate living and bedroom areas. 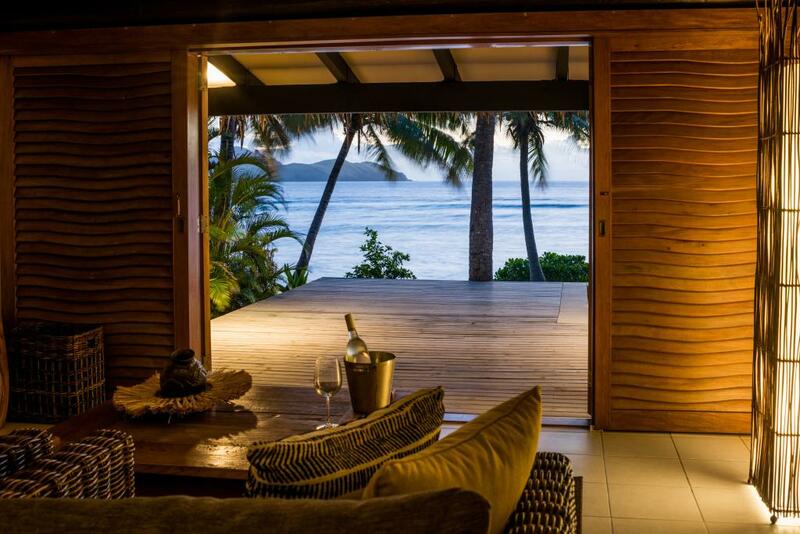 Feature a large 70m² deck with a 3.5m x 2.5m infinity edge pool. 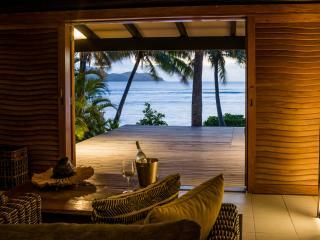 Admire the spectactular views from the double fold out doors that open out from both bedroom and lounge area. From your outdoor shower, you can watch the sun bounce off the infinite shades of blue in the lagoon. 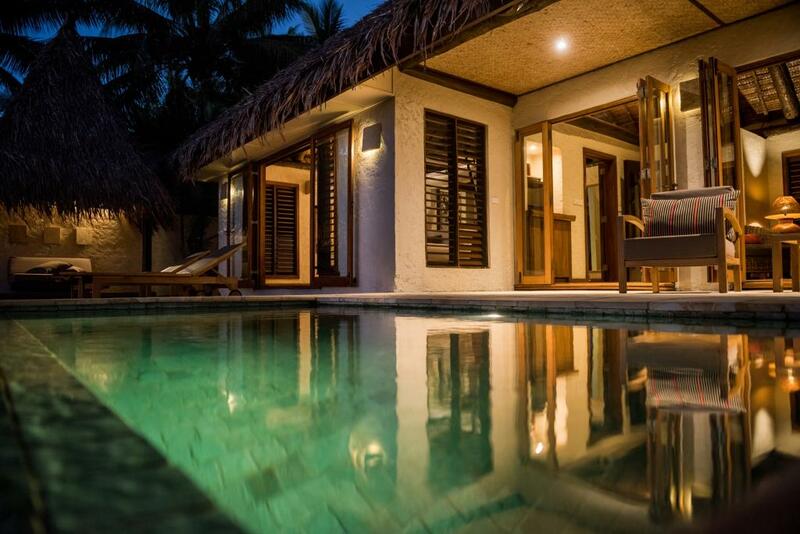 These villas come with the added benefit of daily canapes and laundry service. Bedding is 1 King bed. Maximum room capacity is 2 adults. 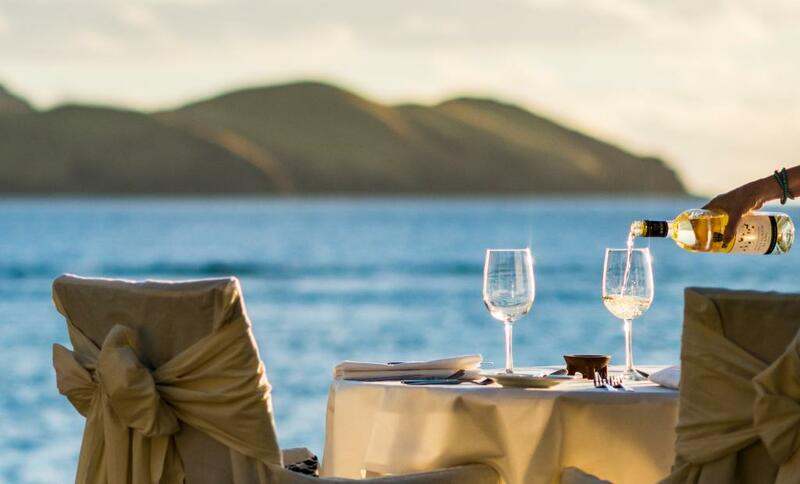 Dining outdoors is a romantic, casual and sumptuous event at Tokoriki Island Resort, with an emphasis on seafood and using local ingredients in contemporary ways, Tokoriki's Executive Chef, creates Fijian inspired specialties with Pacific Rim influences. Lunch and dinner menus change daily, providing you with the freshest ingredients each meal and plenty of variety throughout your stay. Tokoriki serves an interesting blend of European, Asian and local cuisine. 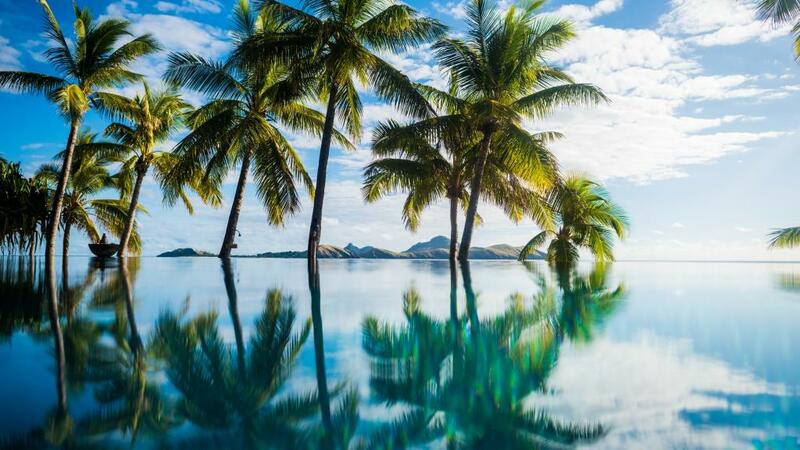 Tropical fruits and fresh local fish and seafood form the basis of the cuisine complimented with Regional produce. 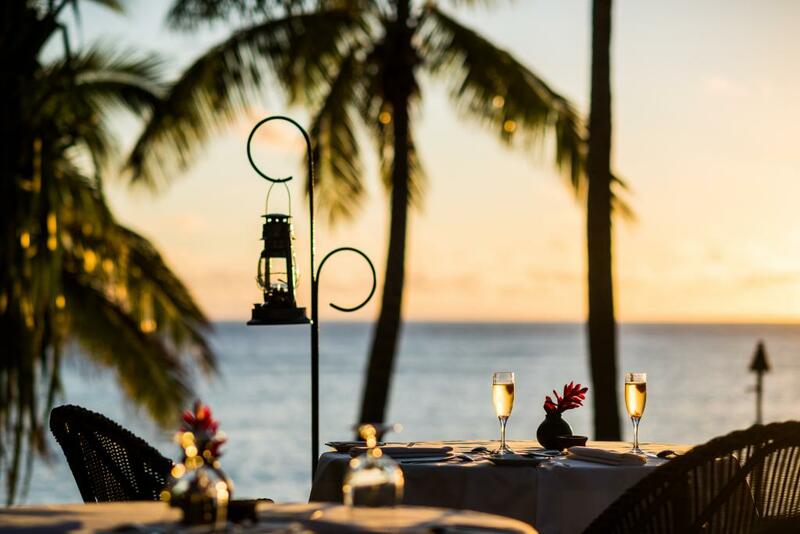 To complement the ever changing menus, Tokoriki Island Resort offers a selection of fine Australian and New Zealand wines and French champagnes. With many wines available by the glass, you can sample a variety before choosing your favourites. 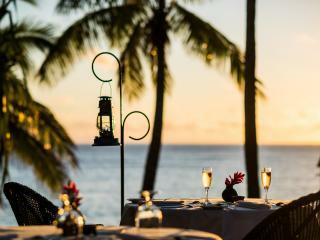 For couples seeking even more romance, a private beach picnic is a decadent way to spend the day. Tokoriki's chefs will prepare you a sumptuous picnic lunch complete with roasted chicken, crisp green salad, tropical fruit plate, juices, water and freshly baked bread. 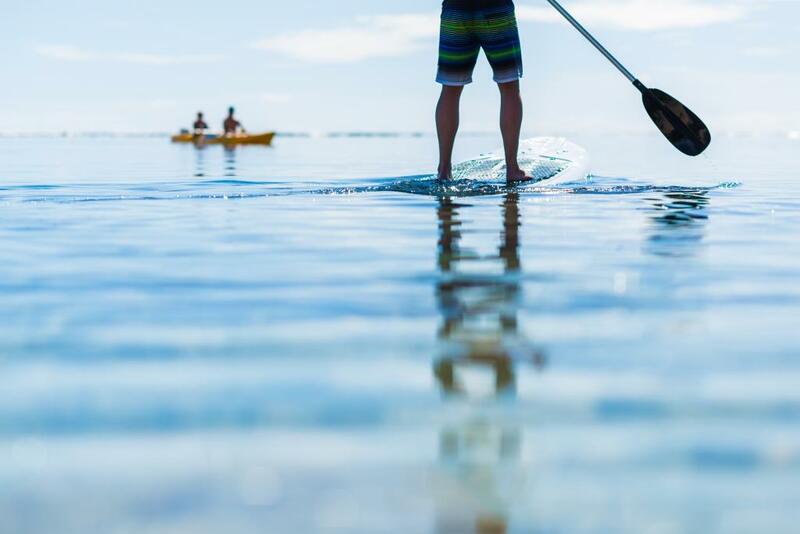 A 20 minute scenic boat ride brings you to your own private beach where you can spend the day snorkelling, swimming, feasting on your gourmet lunch, basking in the sunshine and enjoying each other's company. 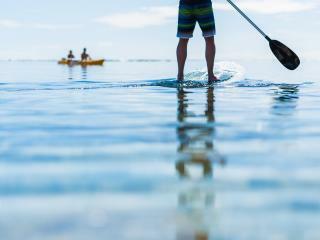 At Tokoriki Island Resort you may decide to do nothing at all. Hammocks abound to keep guests relaxed. 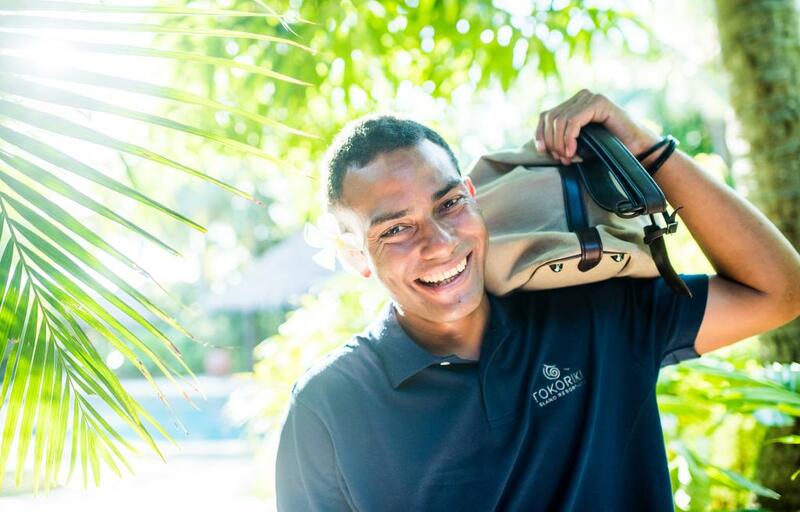 For the more active guests, Tokoriki offers enough activities to keep the most active person occupied all the time. 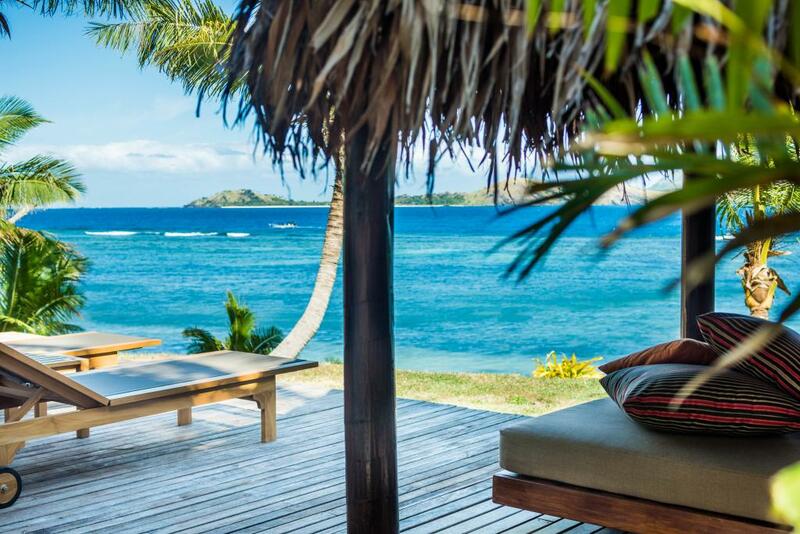 Tokoriki offers a fully equipped PADI 5 star dive facility to enjoy diving courses in Fiji. 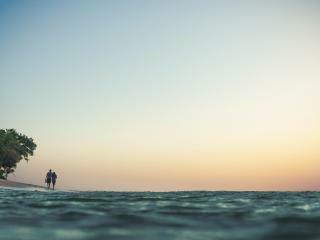 An environmentally friendly dive operation and have a 'No Touch' policy on all of the dives. Guaranteed of small groups and the friendly and experienced dive team, aim to give the divers a fun, relaxing experience, on uncrowded tropical reefs close to Tokoriki Island Resort. The resort will even set up, carry and wash your gear, leaving you to simply turn up and jump on board! 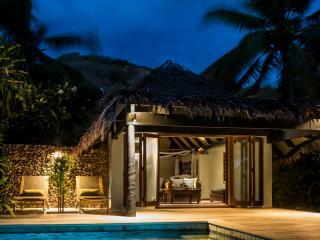 Tokoriki Spa: Indulge in a vast array of spa treatments. 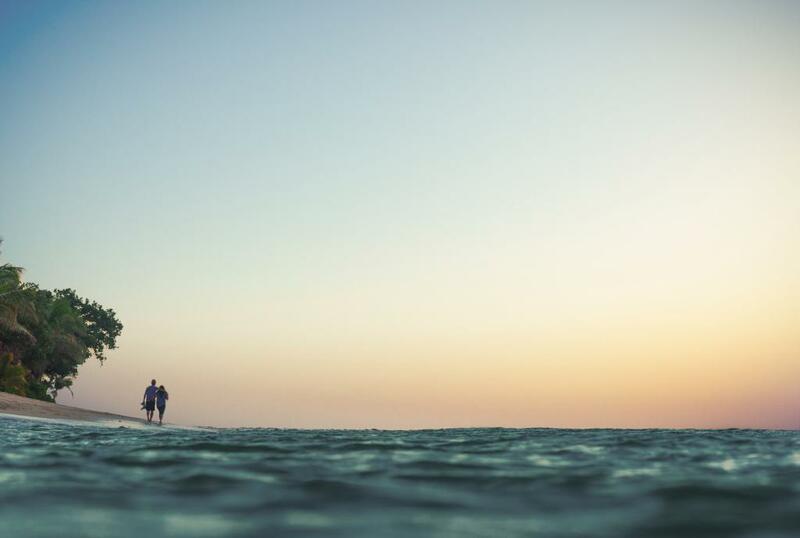 A papaya body wrap one day, a coconut and coffee scrub the next from aromatherapy massages to his & her romantic massages. 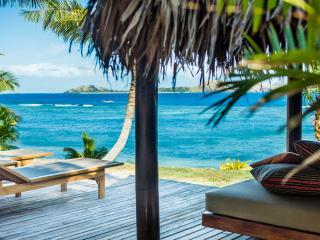 Everyday can be a day of pampering at Tokoriki Island Resort in Fiji. 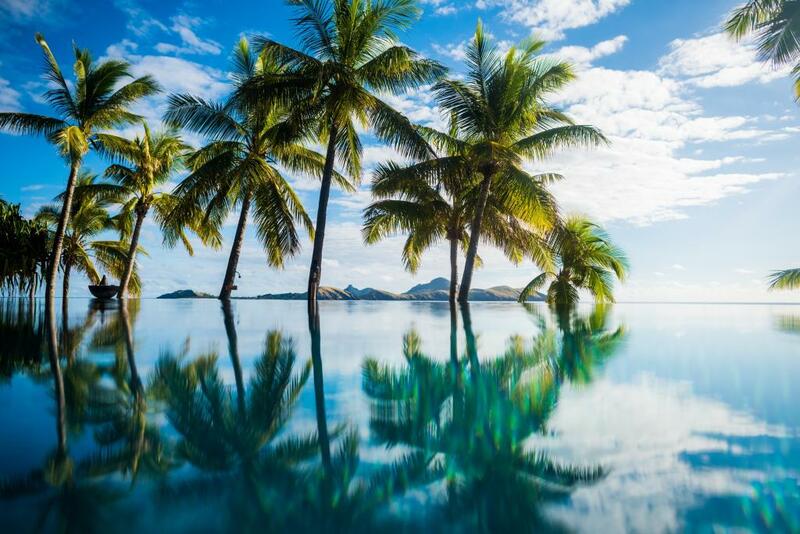 The spa services are delivered by trained and certified beauty therapists from the Pacific's leading spa group Senikai Spas. 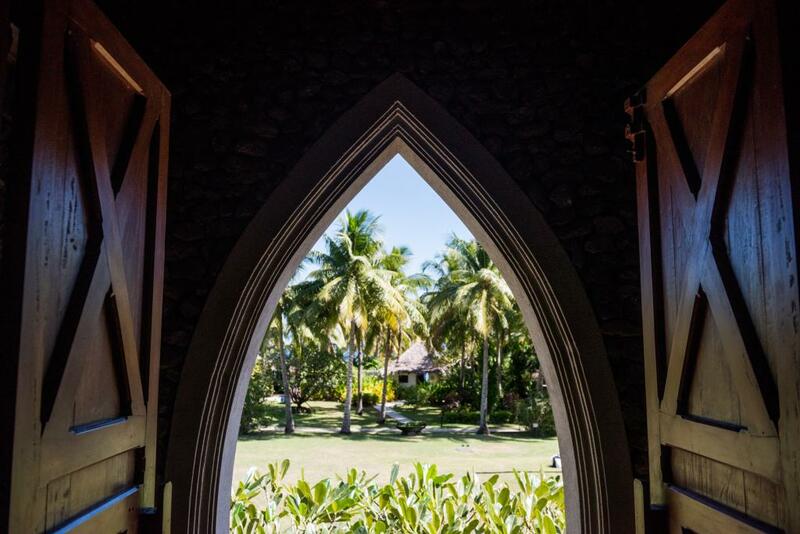 Choose to be pampered in the spa, set within the gardens of the Fiji Resort... or indulge in the privacy of your room... escape on a tropical journey of relaxation, cleansing, rejuvenation and healing at the hands of the spa therapists. 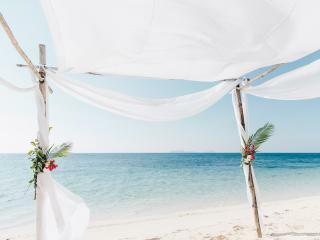 Your beautiful wedding day at Tokoriki Island Resort is designed to celebrate your new lives together without the stress or worry of celebrating your wedding at home. 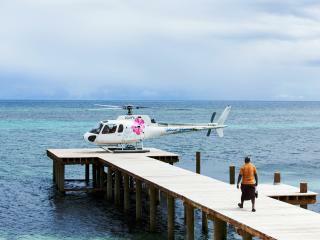 Rest assured, you will experience a truly magical wedding at Tokoriki Island Resort. 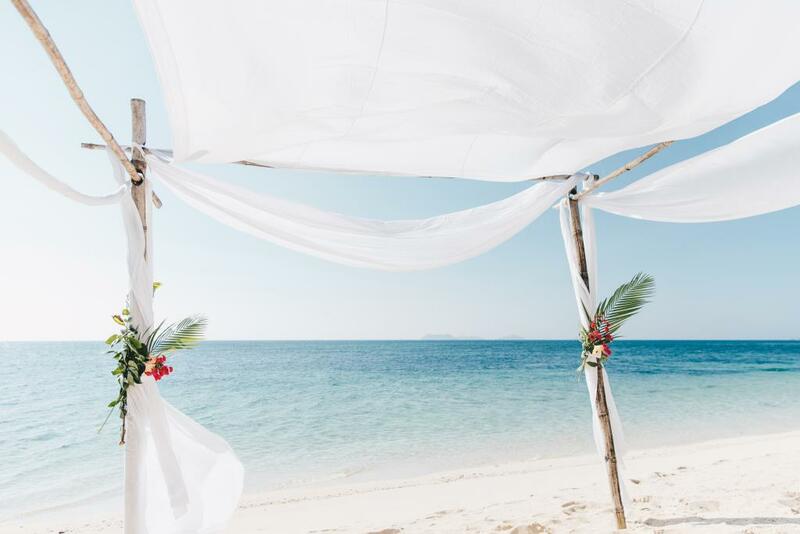 Tokoriki Island Resort's onsite wedding co-ordinator will meet you after your arrival to create the wedding of your dreams. 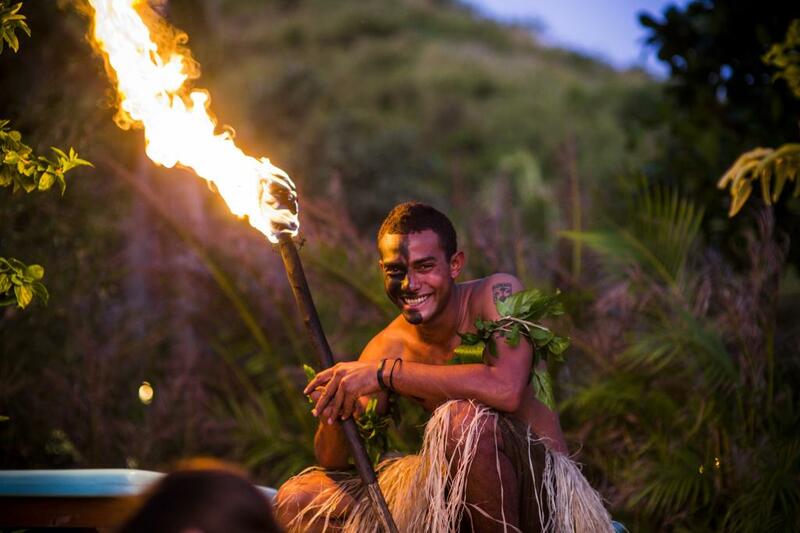 Imagine a simple barefoot ceremony on the beach, or for a more elaborate occasion Fijian warriors, beautiful flower girls or a traditional Fijian choir can be arranged. Please use Instant Quote for Wedding Package prices.